Foundations of Adult and Continuing Education distills decades of scholarship in the field to provide students and practitioners with an up-to-date practical resource. Grounded in research and focused on the unique needs of adult learners, this book provides a foundational overview of adult education, and an introduction to the organizations and practices developed to support adult learning in a variety of contexts. The discussion also includes select understandings of international adult education, policy, and methods alongside theoretical frameworks, contemporary and historical contexts, and the guiding principles of adult education today. Coverage of emerging issues includes the aging society, social justice, and more, with expert insight from leading authorities in the field. Many adult educators begin practice through the context of their own experiences in the field. This book provides the broader research, theory, and practice needed for a deeper understanding of adult education and its place in society. 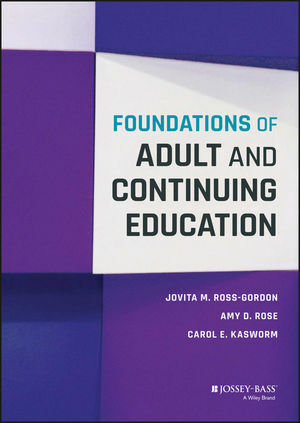 Foundations of Adult and Continuing Education provides an expertly-led overview of the field, and an essential introduction to real-world practice. JOVITA M. ROSS-GORDON is a professor of adult, professional and community education at Texas State University. AMY D. ROSE is professor emerita of adult and higher education at Northern Illinois University. CAROL E. KASWORM is W. Dallas Herring Professor emerita of adult and community college education at North Carolina State University.